A few weeks ago I was on the phone with a grower worried that he had put too much nitrogen on his rice for the cool year we were having. Then, the weather turned and got really hot. 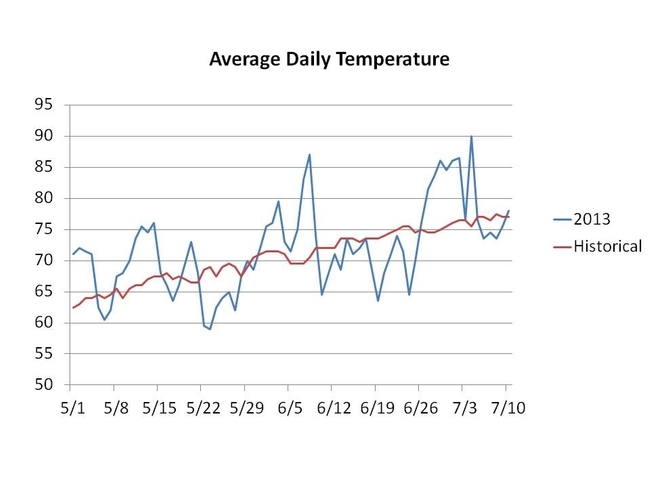 So, are we in a cool or warm year? What is the trend so far? It is hard to come with an answer just by comparing the daily average temperatures for this year to the historical average temperatures. 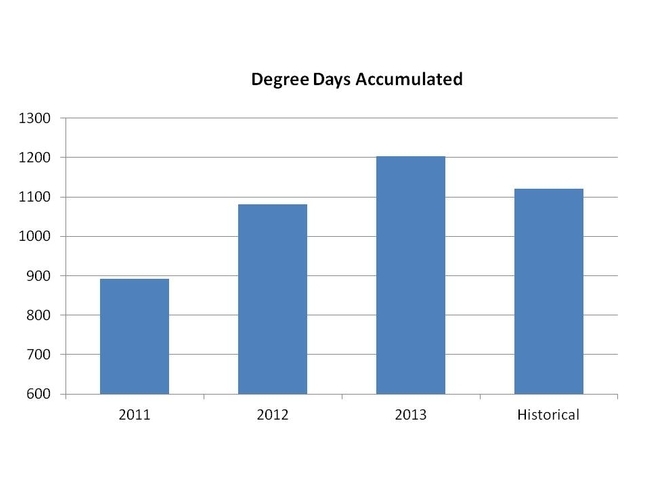 A way to discern what is going on is to look at the amount of heat units or degree days (DD) accumulate so far. Using the Colusa CIMIS station and a lower developmental threshold of 55oF, I calculated how many DD we have accumulated since May 1st. Looks like 2013 is on the warmer side. 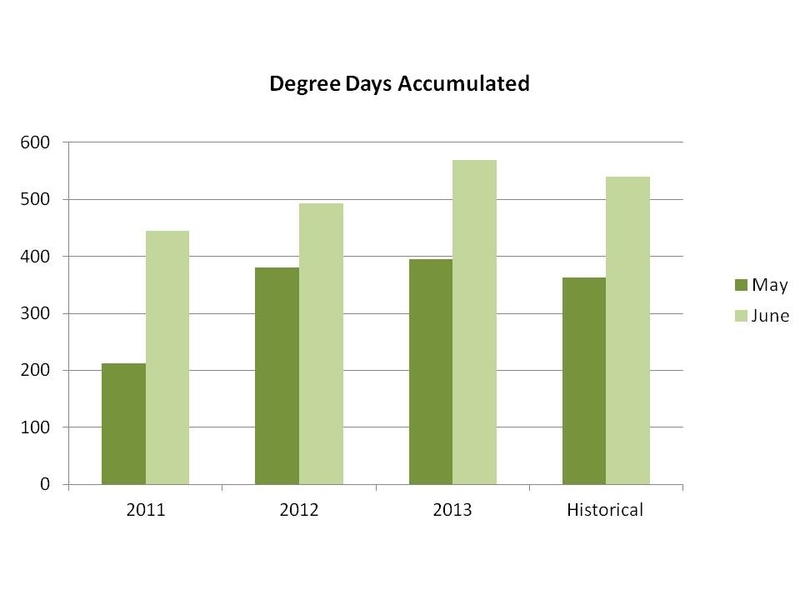 The year 2011 was a characteristically mild year, while 2012 was closer to the historical average. When looking at May and June individually, you realize that most of the extra DD were accumulated in June. 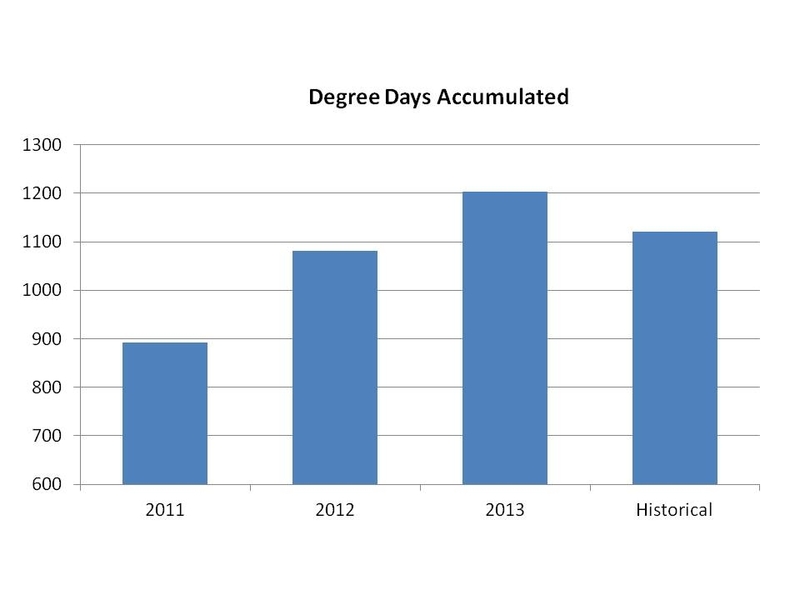 May was closer to 2012 and to the historical average. What are some of the implications of this? Early planted fields are already pass PI. Fields that have not reached PI yet should be evaluated for nitrogen topdress need. Warmer conditions promote growth and nitrogen use, and you don't want your crop to run out of fuel before the end of the race. We've seen that during mild years blast can become a problem in some areas. Warmer temperatures seem to discourage explosions of the disease. If you are considering a treatment, scout your fields to identify infections and talk to your neighbors to see what is happening in the area.